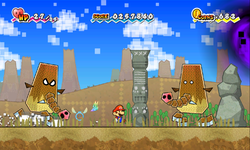 The Land of the Cragnons (called Crag by the Cragnons) is the setting of Chapter 5 in Super Paper Mario. Mario, Princess Peach and Bowser enter the light blue door. It is the home of the Cragnons, a prehistoric race of primitive people with televisions and stereo CD players, seemingly made of rocks. It is also home to the enemies of the Cragnons, the Floro Sapiens, who live underground with their king, who is the boss of Chapter 5. Near the end of the game during the final battle with Super Dimentio, the Land of the Cragnons is destroyed by The Void but is restored following the destruction of the Chaos Heart along with all other demolished worlds. (Chapter 5-1: Downtown of Crag) A rocky region containing the Cragnons' town. The heroes begin pursuing a group of Floro Sapiens, who are kidnapping Cragnons. (Chapter 5-2: Pixls, Tablets and Crag) A mountainous area that revolves around finding three tablets in order to free Cudge. O'Chunks is fought here. (Chapter 5-3: A Crag in the Dark) Home of the Floro Sapiens. The heroes meet Flint Cragley here and are tasked with locating his crew. (Chapter 5-4: The Menace of King Croacus) The lair of King Croacus IV and the facility where Floro Sprouts are made and cragnons brainwashed. Dottie is found here. O'Chunks is battled in the form of O'Cabbage and King Croacus as battled as the Chapter Boss. This page was last edited on March 4, 2019, at 13:25.